Live-blogging for the EDL demo in Tower Hamlets has concluded. Follow-up photos, videos, and articles will appear as separate posts. https://twitter.com/#!/martinuaf/status/109998544370405376 I like this one from an hour ago because it states there were only a few hundred edl. As a matter of interest, an EDL member on the scene put the crowd at around 3,000. In what way did “the community stop the EDL”? The EDL still turned up en masse, and then the UAF went against the police ban. Not good PR. Violent clashes between police and EDL on corner of minories street. EDL trying to break through to aldgate. Horses gearing up. There is a group of women on bikes going after EDL, literally riding their bikes into them and screaming in their face. Bloody heroes!! Police say English Defence League east London demo is ‘calm’. It seems that Yaxley-Lennon might have evaded police arrest. Four police officers went to arrest him but he escaped. Either that or he broke free of the police. Will try to find out more. Getting reports of 500 police heading down Minories, towards Tower Hill. And what’s it all about? Why, the Oslo massacre, of course! Tensions have been heightened by the actions of the anti-Muslim extremist Anders Behring Breivik, who admitted killing 77 people in July when he detonated a bomb in the Norwegian capital, Oslo before embarking on a shooting spree at a youth camp on the nearby Utøya island. 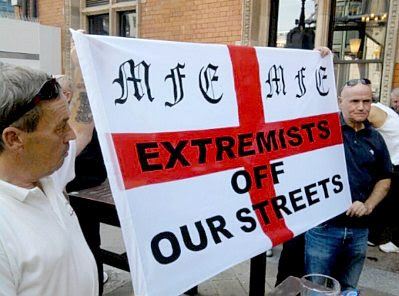 The EDL demonstration is its first since the killings by Breivik, who had praised the organisation in the past and claimed to have 600 EDL supporters as friends on Facebook. “Kevin Carroll is currently speaking about the ineffectual politicians who have sold out to the Islamists. He’s calling them Judas to their people. Tower Hamlets is England. If the government can’t police the Islamists and ensure freedom of speech, they should use the army. “He asks for the government to make military covenant law and pays tribute to our troops, and also emphasises peaceful protest. He was goading the police that he was breaking his bail conditions and invited them to arrest him. It seems they did just that. Video: Tommy Robinson breaks bail conditions & shows up at EDl demo dressed as a rabbi. Pol conf to me that #edl being taken to Whitechapel Rd cordon, but w’re being pushed down Mansell St. Inkling they’ll be taken behind RBS. The crowd is loud, but it certainlydoesn’t sound threatening. There are plenty of police around and that’s about it. It’s a bit too noisy to talk, though. @anne_schulthess i went fascist hunting. The #uaf rally is miles from the edl! Edl is police escorted and protected. Shame! Are you staying? 2.45pm. Several hundred anti-racist protesters have marched from their rally to Osborn St, at the bottom of Brick Lane—in defiance of Tory home secretary Theresa May’s ban on marches. They have stopped close to where the EDL are hoping to rally. Demonstrators are chanting, “Whose streets? Our streets!” and “Black and white, unite and fight”. Notice the “Anders Breivik = Tommy Robinson” placards. Update from Tower Hamlets: It seems that Kings Cross station is now open and a group of 500+ EDL are coming on the tube. We’ve heard that they will come into Liverpool Street, where they will link up with 3-400 already there. So Kings Cross is open again. Update from Tower Hamlets: Just got news from the site of the EDL protest that they are being given the whole of Aldgate. Huge police activity. Update from Tower Hamlets:The EDL are moving off from Liverpool Street in groups of ten. It's going to take quite some time to get them all to Aldgate. Update from Tower Hamlets: The police began escorting the EDL towards Kings Cross station only to find the RMT (transport workers’ union have closed the tube station. There’s 300+ EDL outside the station and no-one has a clue what is happening. Heavy police presence on Mansell St. Putting riot gear on. The demo is beginning about now (14:00 London, 9am EDT). Reports indicate that the demonstrators have been denied access to Tower Hamlets proper, and that the demo is being staged just outside. Tommy Robinson's appearance dressed as a rabbi!!! No need for such counter jihad farce, if the British authorities did not want him to stand on a soapbox in London he would have been detained beforehand. The counter jihad in the U.K. desperately needs a new agent and new clothes. I think if Tommy Robinson gets arrested and put away, the message will have been sent to the English voter: there are no peaceful means available for stopping the Islamisation of your country. Such conditions are indeed "pre-revolutionary". It is a dangerous and irresponsible message to send any population. All I can say is the UK better be prepared to send in the army, because once the EDL and their supporters just lose it, and really start to defend themselves "robustly", the riot cops and UAF aren't going to be able to stop them. If Islamic immigration and Islamic hate-preaching and intimidation aren't stopped outright, and soon, I don't think the UK has a very attractive future ahead of it at all. I am now aggressively shorting the pound, and decoupling myself from the British economy as fast as I can. One thing I can't understand is this: why are Jews living in Judea and Samaria called "settlers", but Muslims living in Tower Hamlets aren't? Typical, just watched the 1700 news, not a mention. It will take the beeb and all the other state controled a little while to create the spin then dish it out to the sheeple. 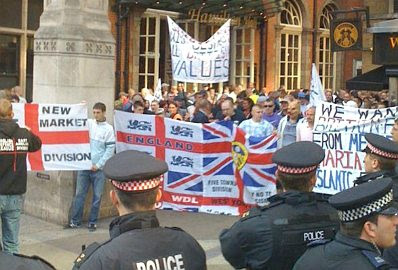 Of course there will not be any positive comments regarding the EDL. All the story writing will be contexualised in order to push the media bias. That is why there is a delay in presenting the news.